Could Live Chat Transform How Councils Deal With Resident Requests? 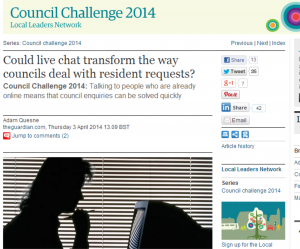 Article Commentary: Could Live Chat Transform The Way Councils Deal With Resident Requests? The Guardian are currently publishing submissions for Council Challenge 2014, an open competition for people working in local government inviting them to come up with ideas for how council services can improve. One recent submission from Adam Quesne, Head of Digital Access at Leeds City Council, talks about the successes of using live chat on the Leeds City Council website. A short survey which online users complete after a chat revealed that 70% of customers would have called the council if live chat was not available. At over £5 per call, the cost of not offering live chat assistance soon builds up. Quesne says that more than 80% of Leeds City Council’s live chat customers stated that as a result of their chat their enquiry was resolved. Live chat means that customers can get fast responses and their problems are resolved right there on the website. 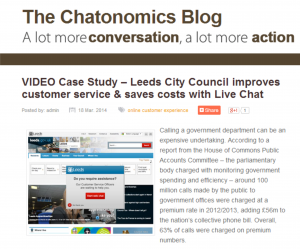 Leeds City Council’s introduction of live chat was also featured on The Chatonomics Blog as a video case study. As this case study describes, live chat also helps to teach residents how to use the council website. Live chat is simple to use, whatever the computer literacy level of the user. A conversation starts with a click of a button and from there a user can be guided around the site by an agent should they need this assistance. The next time a user visits the site they will be better equipped to navigate the site themselves. The Leeds City Council site is designed to allow residents to self-service, meaning less time is taken from council workers’ days. The video case study and Guardian article provide some great insights into how live chat can improve customer service for councils and businesses alike. Links to both can be found at the bottom of this blog post. Feel free to start a chat with one of our agents to find out more about the benefits of live chat.